Here in Louisiana we call it Lagniappe [lanˈyap]. It’s a little something extra……for free! Everyone loves free. 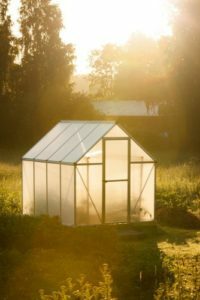 I get asked all of the time how to build your own greenhouse. 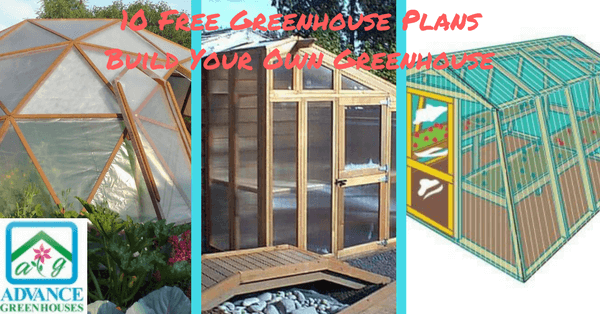 So, today I have gathered together 10 free greenhouse plans for you. Not everyone can afford or needs a glass greenhouse kit. Tom and I have reviewed the plans and have added our comments to each. These comments are based purely on our years of experience building greenhouses. We have not received any compensation of any kind from any of these plans. So, enjoy and get busy building a greenhouse this week. Please keep in mind that as far as we know no engineers were involved in these plans. In other words, we do not feel that any of these plans have been built with heavy snow and/or wind loads in mind. Also, as a general note: A lot of the plans mention using plastic sheeting that is not UV protected. Don’t expect any more than 1 years use out of non UV protected plastic. We always recommend using 6 mil, 4 year polyfilm to cover greenhouses. With the appropriate waivers in place, let’s get busy building! 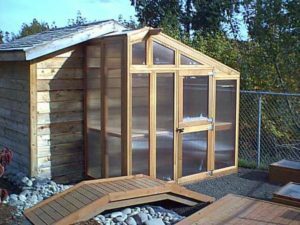 California Roof Style Greenhouse Plans – We used to sell and install sunrooms. That is how we really got started with greenhouses. Anyway, we used to sell a sunroom that looked like this and it was called the California Roof Sunroom. These plans seem very thorough. They even tell you how to square up your base. It is a bit distracting to try and read the plans on their website due to all of the ads, etc. But, they do offer a downloadable set of plans (ad free) for $5. Might be nice to have these to take to the jobsite. YellaWood Greenhouse Plans – These plans are from the manufacturer. They do give you a lot of specifications about the building materials, but the plans are pretty much a line drawing with measurements. If you are an experienced builder, you probably would not have much trouble with this. If you are a beginner and need more detailed instruction, this might be one to pass on. Barn Greenhouse Plans – They state one weekend for this. I am a bit skeptical of that time frame. This greenhouse has a lot of miter cuts and will require what seems like a lot of fitting to me. But hey, who can resist the looks of a barn style greenhouse? Raised Garden Bed with Removable Cold Frame – This is a super plan and will work nicely along side of a standard garden and greenhouse. They are stating a 10 – 15 degree increase in temperature inside the cold frame. This is a great project for someone with limited space, or someone who just wants to get a head start on the garden. 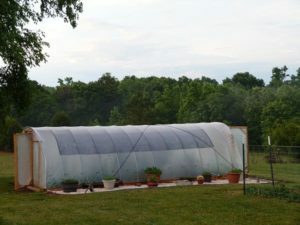 300 Square Foot Hoop House – This is a well thought out design and plan. I do however have a couple of issues with his recommendations. First is to use landscape cloth as a shade cloth. Why wouldn’t you just use a shade cloth that is made for greenhouses? Also, this is a little bit large not to have a ventilation system. I think a couple of roof vents and a ventilation package would make this greenhouse a whole lot more useable in the warmer months. 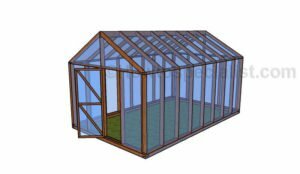 RunnerDuck Greenhouse Plans– I really like the looks of this greenhouse, although I am wondering what it would look like with a small overhang on the roof on all sides. 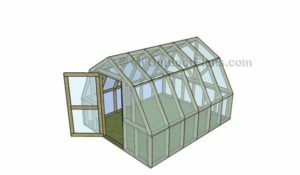 He has stated that you can adapt this to make a freestanding greenhouse with these plans as well. I do like the dutch door feature and the fact that he used a roof vent with an automatic opener. Bamboo Greenhouse Plans – What a great way to use bamboo! I would suggest using batten tape also when securing your film to your frame. I am not really crazy about using a door that is secured with velcro. If you are in a high wind area I would think this would give you problems. Other than that a great simple plan. Geo Dome – This may not be for a beginner. Lots of angles to cut for the frame to fit together properly. 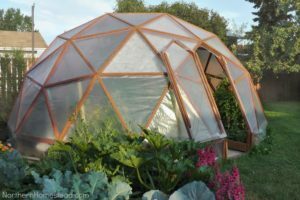 But, who doesn’t love the look of a dome greenhouse? Sounds like they did a whole lot of research before designing this. If you have some skills and time I would consider this plan. 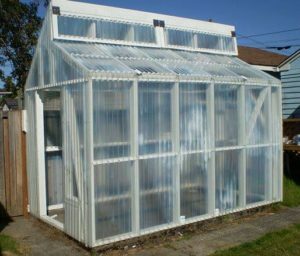 $50 Greenhouse – Of course this is if you can recycle a whole bunch of materials. But, he states that even with new material you can build this for around $200. If you are in an area with high snow be sure to look at the picture of what happens when you get a couple of inches of wet snow. His greenhouse collapsed. So, I would definitely rule this one out for snowy areas. 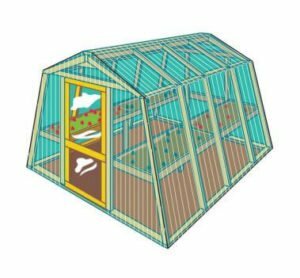 10 x 16 Greenhouse – These are nice plans. I think he is very realistic when he gives a one week time frame on building this. I would suggest a ventilation system and roof vents with a greenhouse this size. He mentions covering it with polyethylene/foil sheets. I am not really even sure what this is. 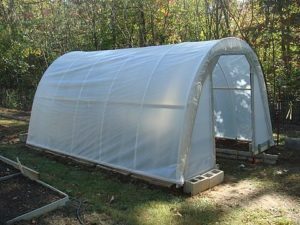 I would recommend using 6 mil, 4 year greenhouse polyfilm. In closing, my first, and second greenhouses were both ones that we built ourselves with our own plans. They were both covered with clear plastic (non UV) film. We did not know where to get the UV protected film at that point. One year is the life expectancy of the non UV material. I wish at the time we would have known the difference, but we just kept recovering. Also, not to tell tales on myself, but at the time we were building these greenhouses there was no internet and no free plans. What a help that would have been! Most of these plans are from individuals who have taken their time and energy to supply these plans for us. We thank them for their help.